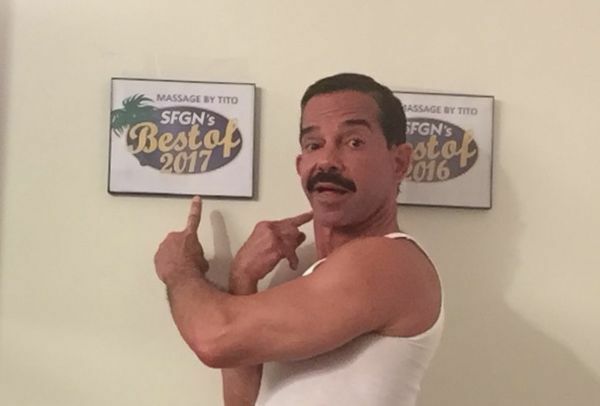 Tito voted Best Massage Therapist in Broward County voted 2016, 2017 & 2018. 2013- “Massage by Tito” was officially recognized by the American Institute of Massage as an outstanding business in Wilton Manors. This well-deserved accolade,acknowledges Tito by placing a plaque on the institutes “Hall of Fame” wall. For Tito it's been an honor to bring the best Deep Tissue Massage therapy to the Gay/LGBT of South Florida and the Wilton...More Manors community. You'll love his comfy, relaxed,professional massage private studio,with it's positive energy and Zen atmosphere. It's located right in Wilton Manors with FREE parking. Relax on his xlarge professional-quality heated massage table, covered in clean, crisp linens. He uses only the highest quality massage oils, organic soap, fresh clean towels, and the atmosphere is unbeatable: perfect lighting/candles and more. Tito is simply an amazing massage therapist. I get a massage from him whenever I am in town and he never disappoints! I have received massages from him for approximately two years. I was in town for a 2-week vacation this time, and got a massage from him on my first day and my last. Perfect bookends for my vacation! There is good reason that he has repeatedly won best massage therapist in Ft Lauderdale"
Good deep tissue massage, really needed work on my upper back, shoulders and neck. He worked wonders on those, and also a really good thorough all body massage. My experience with Tito was awesome. Seems like he has a passion for his work and enjoys his career as a massage therapist. Best bodywork I've gotten in many years of getting massages. I'm glad I found Tito in Wilton Manors because I'll be moving here soon. This was my 3rd massage with Tito. He is always professional, courteous and very good at what he does. I am always able to just drift away during the massage.....a real luxury. Tito is an excellent conversationalist and he checks in regularly to see if the pressure is just right. Go see him, you won't be disappointed. Thanks Tito. I called Tito last minute and he was able to accomodate me. I was very lucky because Tito is a very good intuitive massage therapist he worked on the needed areas like no other therapist has. I guess thats why he came highly reccomened and has won 2 accolades. Keep up the great bodywork Tito. Was looking for Deep Tissue and Tito gave me the best Extra Deep massage ever. He was highly recommended by my chiropractor. The best ! I have gotten massages with Tito for 4 years and when he has not been available I had tried others but never ever the same. If your looking for the best LMT in Broward County his name is TITO :) You will always come back for more so why try someone else?? Tito gave a wonderful deep deep tissue massage. He uses a lot of his wrist and forearm and elbow to really get in there and do a deep massage and relieve tension. He also does your entire body including the top of your head your feet and your stomach, which he explains supports digestion and has a history in Chinese medicine. The Decour was very beautiful and John with a low chanting music dim light and very nice Decor of elephants and cat Statues. Tito himself was quiet yet very friendly and enjoyed talking about his profession and socializing a bit. He even gave me a water at the end to rehydrate and the prices were very reasonable. I would highly recommend going to him for a massage. Tito was a wonderful massage therapist who gave a very deep very intense massage. He uses a lot of his wrists and forearms and elbows to really get in there and relieve tension and give you a deep tissue experience. Yet at the same time it is also very Zen and a relaxing atmosphere with Tim lights and wonderful Decour in the room. He massages your entire body including your head even the stomach and explained the benefits of stomach massage in digestion and Chinese medicine. He was very quiet yet friendly and like to talk about his profession. Oh thank you so much sweet of you know what was I have an app that lime in it he was very quiet yet friendly and like to talk about his profession. The rate was very reasonable. I asked for an immediate appointment (because of pain - I almost always try to schedule a massage well in advance). He was able to accommodate me. I agree with substantially all of his prior reviews. I have probably been on about 50-75 different tables over the years and Tito is certainly best-in-class. Very professional, structured, disciplined, knowledgeable. He asks the right questions and he listens well. My partner and I both went to Tito and he just left a great review for Tito. I'll just say we are happy to finally find a LMT that is great with deep tissue, likes to include plenty of stretching in his session (most therapist don't) and lets you enjoy your massage session. No chat while massaging. He's present at what he's doing and lets you enjoy your massage session. We loved Tito's massage and highly recommend him. Congrats Tito on your award. Did not know who to contact for a massage and read Tito's profile. I read that he had won best LMT in 2013 and just recently Nov 2016 so I decided for Tito. No wonder he's won these awards he truly is the best. What the BEST massage?? Call Tito. Outstanding massage techniques. The cupping completely removed my lower back pain. Tito is a real deal massage therapist with extensive knowledge and experience. I've been to Tito many times before and I love his massage style, deep tissue and cupping. He always includes stretching in his sessions which is great but this time I decided to go for his 30 min stretching for 60.00 and it was worth every penny. You will get muscles you didn't know you had stretched and you will feel like a new person. Give it a try. I will describe Tito as the best if your looking for Extra Deep Tissue. I enjoyed 100% his massage style and techniques and highly recommend Tito is your looking for a true skilled Massage Therapist that knows the body, is intuitive and enjoys his work. Why waste your time with someone who has not studied massage? I have been getting massages from Tito for almost 4 years and I will say like everyone else here has said, he is the be deep tissue therapist I have experienced. With that said good luck if you find someone better. I walked in and immediately felt at ease. I'll make this short. Tito has great strong hands and obviously went to a great school because he knows what he's doing. Best massage ever especially if you are into deep tissue and plenty stretching if so Tito should be your choice. This is my second massage with Tito. My first deep tissue with Tito was the greatest massage I've experienced so I decided buy a gift certificate for my partner and since he has been telling all his friends about Tito's masterful skills. He will be leaving a review after mine. On my second visit I requested Tito a combo of deep tissue and cupping and WOW I walked out of there feeling very light/relaxed and like a KING ! Cupping is the opposite of deep tissue instead of deep pressure/compression the cups create a vacuum and the cups pulls the skin of the patient and helps to alleviate,adhesion's, soreness and more. Love it so will you. This is my 2nd massage by Tito and this time because of Michael Phelps I decided to have some cupping and I loved it. Not painful it actually felt great while I was on the table and better after I got off table. Just as good as Tito's great deep tissue. had the best night sleep in a long time.Next time soon I'll be wanting a full body cupping. Tito can do this without any marks left on body. Called Tito because of his great reviews. I'm very happy I did. I own a massage studio in San Francisco with 5 employees that have been with me for many years because they are good therapist and we all exchange massage for many years. I have to be honest and say that Tito is better than all five of them. I believe that being a Reiki practitioner and a very spiritual guy gives him a great advantage besides the true passion he has for his profession. Many others are there for a quick buck but not Tito. I let Tito know is he ever decides to move to San Francisco he already has a career opportunity at my spa. Check him out. Tito was great! He was able to give an amazing deep tissue massage without it feeling overly "clinical." A high quality and professional massage. I've gotten massages all over from guys on this site, other sites, spas. cruise ships, etc. This massage with Tito definitely ranks in the top. Wow! I have had a lot of massages through the years but I think this was actually my FIRST massage. Tito definitely knows what he's doing and he gives you a complete full body massage. He massages and relaxes every part of y-our body. He even massages your stomach which he explains as the center of so many things including stress. The 90 minutes was well worth it and he even suggested cupping for the back pain I was having which he did and worked great. Most masseurs just get you on the table and are like a machine in the way they massage. You can tell from Tito's massage that he is so focused and determined to give each and every body part the best massage he can. I already saved his contact info in my phone for fast access to make my next appointment! Called Tito and found out he doesn't do out calls and now I know why. He doesn't have to, when your the best in town. I got a great extra deep tissue massage, scalp and abdominal massage. Don't waste your time with 60 min just to try Tito go with the 90 min and the extra 20.00 for 30 min is very worth it. It was a pleasure to get back to Wilton Manors and to have a 90 minute massage with Tito! His expert, professional technique always amazes me in comparison to other therapists I've been going to in my area. It is thorough, rejuvinating and leaves me looking forward to my next visit. My partner just left a review for Tito and I decided to add that Tito is just as good providing an awesome Deep tissue/Extra deep tissue massage as with his stretching techniques, abdominal, scalp and buttocks massage. No wonder he's top rated. My partner and I are from out of town and we been traveling to So Florida for many years and we always get a massage as part of our vacation. Sad to say but good for Tito is that this is the first time we both really enjoyed the massage 100%. We both felt completely stress free and rejuvenated. We will be seeing Tito before our trip back home. That's how good he is. My partner enjoyed the deep tissue and I enjoyed the extra deep tissue. My partner will also be leaving a review for Tito. I was her on vacation and wanted a massage. Saw that Tito is top rated on masseurfinder so I gave Tito a call. Best massage ever and Tito even spent plenty of time massaging my abdomen which felt great. It's an area that I had not experienced with other therapist and it felt so relaxing that I could have fallen asleep or did I? I decided to give Tito a shot and requested 60 min massage. As a LMT I know a good Deep Tissue therapist. I ended with a 90 min massage, What can I say? Another great massage from Tito. He is very responsive to the degree of pressure you want. I wanted deep and he put the effort in to deliver. He combines stretching with massage and now adds cupping (if desired). The cupping was very effective on a hard to get at underlying muscle. Give him a try; you won't regret it. Tito is a pro. He responded to my appointment request quickly, meet me on time and provided a truly awesome massage. He knows your body and continually asks how you feel. Several times I told him how great the massage was. I'll be back and highly recommend him. Tito gave an amazing deep-tissue massage. Avid athlete here with normal wear and tear on the body. He worked me over... By the end of the 90 minute massage I was completely relaxed and my muscles got the work over they needed. Friendly guy, clean place, big table. I will go again. This was my second visit to Tito. He gives a great massage. He does wonderful stretches and allows you to decide the pressure. He consistently checks in to make sure pressure is good. Makes you feel very comfortable. I highly recommend. Tito gives an excellent deep tissue massage on a very comfortable table. Space is very clean, free parking. Very professional, quality work. Highly recommended. I Live across the street from Tito but had never gotten a massage with Tito because I had a therapist I've been loyal to. After my therapist canceled my appointment twice in 3 weeks I decided to give Tito a try and I'm very happy I did. I had only gotten massages by 4 different therapist and I thought my last before Tito was the best but I guess I was wrong. Tito delivers what he promises and I can see why he has such great reviews and more reviews than others. He did an awesome job with my lower back pain and has been the only therapist to provide a GREAT neck shoulder massage and stretches like a real professional. Of course I'll be back for more. Need a massage? Try Tito first. Awesome carrying case gift Tito has for his clients. After many great massages by Tito I will say he is the best. I go to Tito for EXTRA deep tissue. Tito delivers what he promises and that's why I have made Tito my therapist. He has very strong hands and that's what I need for my neck, shoulder and upper back stress. I also appreciate his nice clean Zen studio conveniently located on wilton drive close to everything. This is the first time I got a massage from Tito. I enjoyed it very much. He really helped my lower back. I plan on using him again in the future. Been going to different LMT because of my shoulder neck and lower back problems the past 6 month. I saw Tito's sidewalk sign on Wilton drive walked in and Tito was able to accommodate me with I did appreciate. To my surprise before I got off table I was feeling 90 % better. No other therapist had been able to accomplish this. I did notice Tito using techniques no other therapist had used and was the only one to stretched my neck/shoulder area in different ways. Now that I found Tito I will be back. Thanks Tito. I called Tito to schedule an outcall massage and Tito only does incalls so I decided to visit Tito and it was a VERY good choice I made. No wonder Tito got an award from the Massage Institute in 2013 he knows what he's doing and he's simply the best. I've had many, many massages in my lifetime and I can say for sure Tito's # 1 on my list. Don't waste your time like I did and call Tito today; and you will be back on masseurfinder giving Tito a great review because he deserves it. Being a Massage Therapist myself, I've lived all over the world and I can say that Tito is the best therapist experience I've had. Great intuitive techniques. If you enjoy Deep Tissue Tito is your man. I'm retired now so I'll be recommending Tito to all my friends. I just experienced why people enjoy getting a massage with Tito. He does have a gift and that is his strong intuitive hands. I got the best Extra Deep tissue massage in my entire life and I'm use to getting a massage every week so I have tried just about every massage therapist in Broward and Dade county. Want the BEST deep tissue? Go to "Massage by Tito" on Wilton Dive. This is my 5th massage with Tito this year and I can see why he got a recognition/award from American Institute of Massage in 2013, he's simply the best. Great job Tito. This was a calm, soothing and relaxing experience. The running waters and music in Tito's studio definitely added to the calming mood. Throughout the entire massage session, Tito was attentive to me and often asked how I was doing....if the pressure was OK, etc. I truly appreciated that. The stretching was an added bonus. I most certainly will schedule another appointment soon with Tito. Thank you Tito for the wonderful massage!